- You’ll unlock Reunions immediately after completing Getting a Clue. 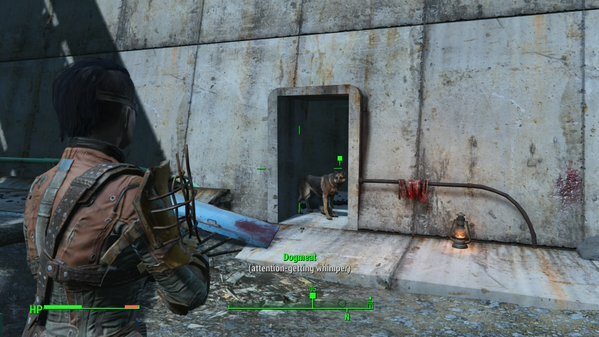 Once you leave Kellogg’s house you’ll find (or should find, anyway) Dogmeat waiting outside. Let him sniff one of the San Francisco Sunlights you picked up inside the house and he’ll head off into Diamond City… and then out of Diamond City. - Keep following Dogmeat. He’ll lead you southwest, out of the city, to a small stream. Beside the water is a crate; sitting on top of the crate is an ashtray with another San Francisco Sunlight. Pick it up to continue the chase. - Dogmeat ho! From the road he’ll take you west along a railroad track. Be prepared to fight some Mole Rats that burst out of the ground along the way. Once you reach crashed train cars Dogmeat will lead you down onto a roadway, where you’ll find a destroyed Turret and a doorway. Check the bodies around the Turret for a nice number of items (Stimpaks ahoy! ), then check the Bloodied Bandages beside the door. - Dogmeat continues. Back up on the tracks you’ll meet some Wild Mongrels that need a-killin’, and a ways down the track, just past a fallen log, you’ll find a hulking Stunted Yao Guai (a bigass bear) that requires some of the same. It’s quite a powerful beast, so keep out of melee range and aim for its legs, if you can. - Shortly after the Yao Guai encounter you’ll see a small Waystation on your right. Pop into it and you’ll find an interior through a latch on the top. There’s not much space inside, but you’ll find plenty of chems here. (Also, a slightly creepy scene.) Head back outside and you’ll find a warehouse ahead and on your right; follow Dogmeat inside and down the stairs. He’ll lead you to a Gwinett Stout Bottle. Grab it. - Onward, pooch! Dogmeat will lead you onto a bridge jammed with traffic. (Watch out for a hole in the bridge. It’ll dump you into the water below. Mean design!) Once you try to weave through some rusted transport trucks you’ll be attacked by two Feral Ghouls, and a much larger pack is hanging out beyond the trucks. Let Dogmeat draw their attention while you fire from the sidelines. Nick is handy for this part in particular. - Dogmeat will lead you into Forest Grove Marsh, a partially-submerged community with several houses that you can explore if you wander away from Dogmeat’s path. Wander as you like, though there’s not a ton to see here unless you’re willing to abandon the quest for a while. Don’t worry, Dogmeat remains in place until you ready to keep going. Be ready to fight Ghouls as you explore the ruins, particularly if you head down into the water. - Dogmeat leads you to the remains of an Assaultron on the side of the road. Check near it for some nice swag - there’s a box here, and a medi kit - then look beside the Assaultron’s severed head for, yep, another San Francisco Sunlights. The scent will lead Dogmeat off of the road and across country, and he’ll lead you to a length of broken fence. Check the fence for another bloodied rag to continue the trek. - In fairly short order Dogmeat will end the trail in a new community: Fort Hagen. He’ll guide you to the front of the Fort, and, uh, well, the rest is your job.